The last class!! Today’s recipe was Stir-fry noodles “Yakisoba”, which is kind of greasy cafe’s menu. This should be the easiest and quickest recipe at my class. I thought there were many people who don’t eat pork for religious reasons. 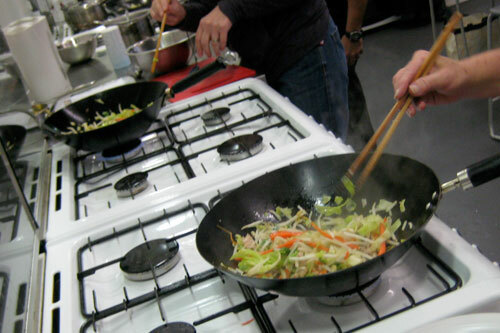 But Stir-fry noodles without pork is not Japanese Yakisoba. When I asked the students if they eat pork, they don’t mind using pork. Then I was cooking noodles in proper way, one lady ,who wants to avoid pork, came in. I’m sorry. . .it’s too late. 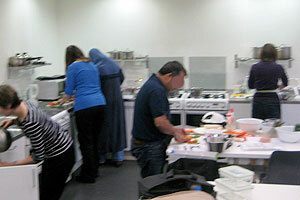 Due to easy recipe, many people cooked individually. 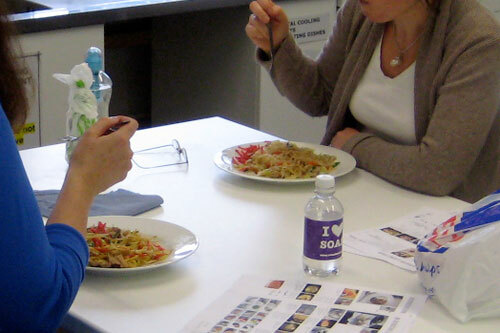 The lady enjoyed cooking vegetable noodles. After the cooking I got Christmas card and small present from one of students. And each student came to say thanks. Some said they tried my recipes at home and all family enjoyed them. Other said their family were looking forward to bringing her food from the class. I really appreciate what all students said to me. Also, I was asked if I take over the next course. I was thinking or was looking forward to taking the class if I have offer until yesterday actually. But there is something I should deal with next year. I want to carry on my class at home, this the first priority. Then I don’t think I can handle both jobs. The class at Institute was very interesting but I may be able to come back. I had a great great experience and I could learn a lot from my students at this school. I want to say big thanks to everyone. I had received 2 emails from the students before the class started. They can not come to the class because they are not well. This winter is full of virus. My son, he is quite healthy never caught virus before, finally has had a fever 39℃ for 3 days and he was diagnosed chest infection this morning. Get well soon everyone. Today’s recipe is Tempura. 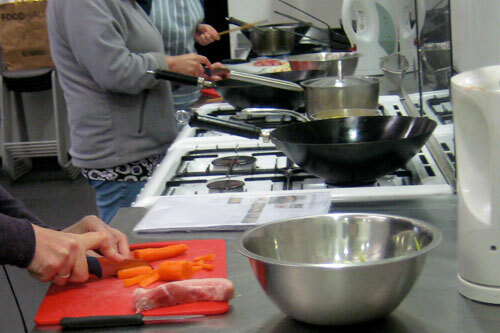 When I demonstrated how to cut and skewer the vegetables and fish, the most attract thing was how to prepare the green beans. As you know green beans are thin but I skewed them using toothpicks then cut them to make nice shape. Look at this Tempura below. He kept oil temperature properly, coated with the batter thinly then the timing for cooking was perfect. He seemed to be very happy. I was happy, too. While the class was going, I was asked why Japanese are thin despite of taking sugar in food and deep-frying. This is not the first time to be asked. First of all because of gene, which nobody can not change but our diet keeps good balance. We eat moderate amount and eat variety of food. I think these things keep our body. After the class I had a meeting with the leader for feedback about my observation. I didn’t have any self confident at all because I have a little experience to teach cooking class in English and I had no time to learn about the other teachers do. Beyond of my anxious she was very happy about my class. At the same time I had a lot of great great great comments from the students. Thank you for the all support. Most students expect me to carry on the next term but there was a contract between the school and original teacher. I was appointed just before this class started without any explanations. I didn’t ask the reason why she gave up the class. So I don’t know yet about the next term. The leader said she was waiting the reply from her. I don’t mind but at least I am lucky to have a great experience. Before the class started one of the students came to me with a bunch of flowers. He thought there is one class left (actually 2 more classes) but he wouldn’t come here due to his business and this should be the last chance. So he wanted to show thanks for this cooking class. I’m very much pleased with his expression. He said to me “You are the good teacher.” (Really!!??) I didn’t know what to say and I didn’t expect such a great gesture. The only I could say was “Thank YOU!”. I got inspected by the leader finally. She was staying for about 1 hour. But I was too busy mind my business to care about what she was doing. Next week I will meet her for feedback, which everybody doesn’t like, of course I’m not exceptional. Let’s see. . . 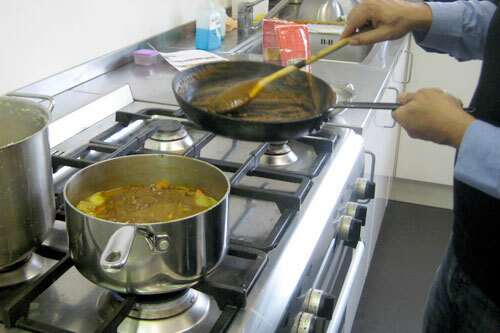 I taught how to make canteen style Japanese curry (OSOZAI Curry) today without instant curry paste. Actually, when I cook Japanese curry at home I always cook with curry powder not the paste. In Japan pork curry is popular but there are some who don’t eat pork so I arranged chicken curry. This is good for the cooking class because it takes short time to soften the meat. After I demonstrated it’s time to trial for the students. They are really good. I tried to check all students. But each curry was different colour, texture and taste. Some curry were yellow and thick the others were brown. This was very interesting. They used same ingredients according to the same recipe but each curry was different. Anyway, they took away their own curry in the food containers happily. I had another great time. Well done, everyone. Today I was arranged to get inspected by the supervisor. So I decided to teach Udon Noodles with Deep-fried bean curd (KITSUNE UDON). It should be easy to demonstrate and I thought this noodles is very Japanese. There are some interesting Japanese names of food but quite often I don’t know the reason why it’s called, such as KITSUNE UDON. KITSUNE meens foxes. Fox Noodles should be strange name for everyone. It IS SAID that foxes like sweeten deep-fried bean curd, really??? Personally I don’t believe it. And the colour of the bean curd is similar to foxes, yes I understand that. I googled about this. To teach something gives me good opportunity to learn. To introduce unique ingredients is fun for me as I can see their reaction. When I showed steamed fish paste (Naruto), it was asked if the taste was sweet because looks like rock candy. I finished my demonstration but no one came to see me. Never mind, I had to carry on the class. It’s second time to teach how to make Japanese soup stock. I can show casual way using soup stock powder but I want them to learn subtle flavour. In case they prefer to cook easier way, I brought soup stock powder, Dashino moto. However no one try to use instant powder. Further more one of them asked me to buy left over dried bonito shavings (Hana gatsuo). No one came to observe me today. The receptionist kindly phoned the supervisor and she said there was an urgent meeting then she forgot it. It’s O.K. But it is postponed to next week, ummmm. Today’s recipe was Green tea Cheese Cake. This cake was mentioned on the brochure before I was appointed. Actually I’ve never tried Green tea cheese cake and I don’t think this cake is popular in U.K. nor Japan. But I have my cheese cake recipe, so I decided to arrange the cake with green tea. I thought baking the cheese cake was not difficult. But for example, it seemed to be hard to make meringue properly because it has to be divided egg yolks and whites precisely and the timing of adding the sugar would be delicate procedure. I baked basic cheese cake so many times so I can make without thinking but for them every process should be the first time. I should’ve explained every step and given tips. I learned that cooking something by myself and teaching would be different sometimes. Today I had to go to the venue of the Charity Event for Japan in Hampstead after the class. I told one of students that I organise the Charity sale then I have to rush to. When we were about to leave the class room she handed me a note saying just “Good luck!”. I was quite surprised. Of course I didn’t expect that she gave me a donation. I didn’t believe the amount of the money, it was not coins. Thank you thank you thank you. There are still a lot to learn from the local students. Unfortunately there was no pictures today. I forgot to bring my camera again!!! I didn’t have other cooking class today. So I didn’t have to rush to the institute and had a time to have lunch with my husband at home without child. Today’s recipe was Yakitori (Japanese chicken skewer), which is very popular among local people. 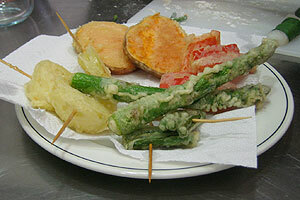 I wanted to show Yakitori is very simple dish and you need a few basic ingredients but the taste is great. First of all I showed how to make Yakitori sauce and grilled them. While I was grilling the skewers I cooked another chicken on the frying pan. I wanted them to see the difference between grilled Yakitori and panfried one. I explained that chicken thigh is more popular and expensive than chicken breast. For us chicken thigh is full of flavor and if you cook the skin crispy this will be nicer. It’s their turn. Now they know each other and try to understand my English and my character as well. We feel relaxed. I think they learned Japanese sense about food not only Japanese ingredients and recipes. For example, they could cut the chicken as I did. When I demonstrated how to cut, they were surprised the size of pieces. I’m sure there is no recipes other than Yakitori to cut into such a tiny pieces. To skewer those chicken bits and spring onion would be difficult for them. But they could do beautifully. I saw they were brushing the sauce with the kitchen brush with care. 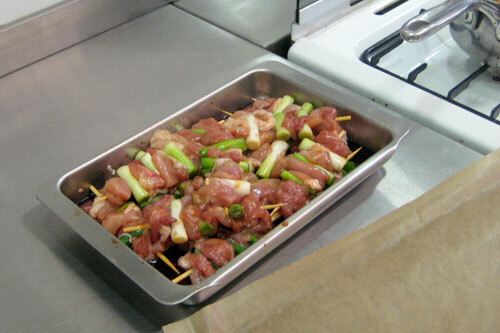 Some of the students took away without grilling, marinated the chicken skewer. They want to share Japanese food with their family. This would be nice. It is the half way today. 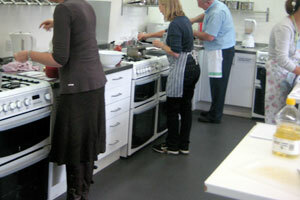 I got used to the people including the staff at the school and this kitchen. Although I’m not satisfied with my English at all, I believe my own way. Because of London, there are a lot of nationalities, religion and allergy, which I hardly meet in Japan. I try to work on demand as much as possible. If they thought “Yakitori was very easy at the class. I can try it at home.”, I will be happy. Today’s recipe was Inside Out Roll Sushi. First of all I wanted to show them how to make Japanese Omelette for sushi (TAMAGOYAKI). When I was about to use my frying pan, the students burst out laughing. Because they’ve never seen SQUARE pans like this. Cooking omelette must be amazing kind of show. I didn’t expect that they like sweet omelette but they love it. When I offered more omelette later, some said “YEEEEES!”. Then I demonstrated how to roll inside out roll sushi. When I tried to wrap the sushi mattress with cling film. They are laughed again at the Japanese mini cling film. O.K. It is a small, different texture but easy to cut, I showed off everything about Japanese cling film. It’s their term. I could see they enjoyed and rolled sushi beautifully. Look at the picture below. I could talk a lot with them. What I am surprised is that they know about Japan and Japanese market very well and active. A man brought Japanese basil (Shiso) because he found it in a Japanese grocery. Other man, there are 2 men in the class, told about Japanese shopping centre in London. Others know which products they are dealing with. There were so many questions as usual. So I’m busy to answer for them. I feel they are really interested in and love Japanese food. I like this class! How time flies! I hope they enjoyed another sushi and they can try it at home.